I started to listen to this book curiously one night, hoping to finally have found a good audio book. I can honestly say that I was not in the slightest bit disappointed. I stayed up all night long, (I seem to do that quite often) enthralled by this story. This was really a story that I, as a 9th grade boy, can really relate to. Not the whole electrical superpowers thing, just that the main character was a 9th grade boy who, though it never actually says it in the book, is kind of a nerd. Or at least, it seemed so to me. 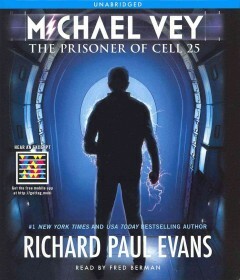 Michael Vey is a pretty average kid on the outside, but in actuality, he has the ability to electrocute people with a single touch. Now, when I first started the book, I thought it was just a re-run of I Am Number Four. Pretty soon though, these suspicions were soon eradicated. It may not have the most unique plot line, but what it does have is originality of writing, characters, and overall realness. Again, I am not referring to the whole electric superpowers. I'm referring to the personalities of the people and, most importantly, the writing. Richard Paul Evans makes his writing believable. He writes it sincerely, making you want to believe this story actually happened. And this just makes the book that much better. Michael Vey is narrated by Fred Berman, best known for voicing the character Timon in The Lion King. He portrays the thoughts of Michael incredibly. There isn't much special about his voice except for the fact that he speaks in a way that makes everybody want to stop and listen. I seem to be using this word a lot, but he speaks sincerely and it makes listening to the story he's telling a very enjoyable experience. This, added with an incredible story, makes for a very good audio book. I'm always looking for a good audiobook, I'll have to check this one out! Very nice review Austin!